Paul Greengrass is making a name for himself as one of the most interesting directors around at the moment, namely because he actually does his homework. Using his experiences as a former journalist, he has made factual films like United 93 and TV movie Bloody Sunday, even fictional tales like his Bourne films and maybe-maybe-not Green Zone, seem all the more credible with that little bit of research. He got nominated for an Oscar for doing it on United 93, and is bound for the Dolby Theater once again for his stunning work on Captain Phillips. Another real-life tale, here based on the first-hand accounts of Richard Phillips during his experiences with the Somali pirates, Greengrass lets it all play out on screen for as long as it needs to, adding suspense and drama to the situation. Demonstrating this perfectly is during the pirates’ takeover of the American ship, as leader Muse (Barkhad Abdi) searches for the remaining crew who have hidden within the dark bowels of the freighter. When the invader slowly creeps his way down the stairs into the darkness toward the hiding crew members, it leaves you on the edge of the seat in anticipation of whatever outcome. It is one of many gripping scenes as steered by Greengrass, whose talents behind the camera are unquestionable. Other crew members worthy of mention are the film’s screenwriter and cinematographer, Billy Ray and Barry Ackroyd respectively. Ray has penned an intelligent script that pinpoints both sides of the argument, so that it neither feels biased nor contrived. The film’s opening is testament to that, showing Phillips (Tom Hanks) preparing for the fatal voyage at home and being dropped off at the airport by wife Catherine Keener, wisely making one appearance in this opening only; and then cutting to a Somali village where Muse and fellow hijackers are threatened into committing these acts by ruthless gang lords in order to provide for their villages and, by all accounts, the gangs themselves. In addition, it portrays these characters as humans first and caricatures second, which is remarkable given how easy it could have been to portray the Somali pirates as stock bad guys who are only in it for the money. All of them act with smart logic and quick wit, and are even prone to making mistakes along the way. During an early attempt to take the ship, Phillips diverts the pirates by pretending to phone the Navy and request back-up, knowing they will be picking up on a radio and flee in terror. It sets Phillips aside from normal Hollywood heroes because he actually uses his brain to temporarily combat a threat rather than just acting on will and action like a lot of them do. Later, Phillips almost succeeds in escaping from the pirates by being let out on the notion that he needs to use the bathroom. One could claim idiocy on the pirates’ front for not seeing this outcome, but they’re not criminal masterminds nor are they even admittedly that smart. They’re just naïve young men from a rundown village acting tough as a scare tactic. Obviously, they do not have everything thought out as one might expect so their blunder is forgivable. Once again, it’s writing like this that makes Billy Ray’s screenplay a delight. It gives us reasons to both like and hate these people, but never favours one over the other. Ackroyd, as the film’s visual master, lends a key eye into making the right scenes suspenseful and dramatic. Aforementioned scene of Muse searching for the crew is shot firmly in the dark, but enough so that it doesn’t black out the screen entirely. The lighting gives the feel that anything could pop out of the darkness at any moment, and its use in other scenes like many set in the lifeboat is tense as it is engaging. However, like Greengrass’s other work, it likes to use the shaky-cam element all the way throughout which may distract some critics of the gimmick but to be fair, it’s downplayed a bit more here than before. When it’s used correctly, and you can actually see what’s going on, it becomes more and more exciting as well as adding to the realism of everything. Thanks to Ackroyd, it doesn’t look nearly as nauseating as it could have been and he helps the film find its visual language without audiences reaching for their sick bags. Hanks’s performance is certainly his strongest in a long while, possibly since 2000’s Cast Away. It will surely wind him his first acting nomination in so many years, but not for the reasons you may think. His performance is rather downplayed than it is over, more calm than panicking, subtle and collected without looking like he is searching for Oscar gold. The character of Captain Richard Phillips is a thinker first and foremost, and Hanks reflects that wonderfully here. As he takes the pirates on a tour of the ship when they demand the rest of the crew, he walks through everything as if everything were normal; completely discounting the fact that he is being aimed at by dangerous criminals. All the while, he lets his crew take as much time as they need to prepare themselves in avoiding capture while remaining calm and cool. Phillips may not be a hero in the traditional sense, but his brain power eventually spares the lives of his innocent crew members and that is worth hanging on to. It comes down in the final scenes which play heavily on the emotion, especially as Phillips is checked by a physician. Clearly traumatised by the events he has just been through, Hanks delivers an onslaught of fear, panic and upset in these closing moments and they all add to a wonderful performance. Also noteworthy: Phillips’ portrayal has come under fire by former crew members, saying that the real captain was not as heroic as the film made him out to be and was something of a self-serving commander prone to anger and control. That side is definitely hinted at here if not fully addressed, as in a scene where he reminds his crew that the only way off the boat is at its final destination. His raised voice at the end of his speech gives a feel of authority that only a captain could use to dominate others. But this being an adaptation, it is given leeway in showing a fictional account of the events. If you want the real thing, watch a documentary if it exists at all. As good as Hanks is in the lead role, the standouts by far are the Somali actors, in particular Abdi as leader Muse. It’s unbelievable that all four are pure newcomers to the industry, their naturalism and grasps of individual characters proving to be incredible to the unsuspecting audience member. None of them have the same amount of heavyweight power in Hollywood as Hanks does, which makes it all the more amazing that these four men can draw attention away from such a familiar face as Hanks’. Abdi especially shines in what should be a career-making performance, as a character motivated by a strange mixture of confidence and fear. One of these things seems to shine more than the other on the outside, but from the opening scenes leading up to the eventual hijacking we get a sense of his inner ambitions and how he will not allow his fear of the gangs to control him. Abdi wears the character like a fine leather jacket, proving intimidating when wearing it despite his raggedy, thin appearance. He’s a marvel, and should be rightfully recognised this forthcoming awards season. Paul Greengrass has picked one hell of a belter with Captain Phillips, combining everything that made the director the respected auteur that he is today with help from celebrated outside sources from the writer to the cinematographer to the actors, and making a suspenseful and emotional masterpiece to match that of his own United 93. 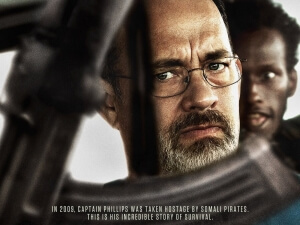 Captain Phillips is intense filmmaking at its finest, thanks to precise directing by Paul Greengrass, tight lensing by cinematographer Barry Ackroyd, intelligent writing by Billy Ray, and wonderful performances by the cast, especially Tom Hanks and Barkhad Abdi. It is one of the year’s best, and essential viewing for anyone wanting to be moved and excited at the cinema.